It’s common to say that “Everything I Know in life, I Learned in Kindergarten.” At Saint Andrew’s School, this saying rings particularly true about the school’s very own distinguished Junior Kindergarten & Kindergarten program. Finland is widely known as a world leader in early childhood education. What does Saint Andrew’s have in common with Finland? It has to do with what makes the early childhood program so successful. Both successes are attributed to the concept of coherence. Kids in Finland are universally channeled into a program for children at four and five years old - a program designed to align with what they’re going to learn later in school. Saint Andrew’s Junior Kindergarten and Kindergarten learning objectives are also aligned with those seen in the Elementary years, grades 1-5. Just ask Shanna Bober, senior and lifer at SA. “Kindergarten is special at Saint Andrew's because you are with a group of friends that you will be with for the rest of your years at the school.” Skills Shanna learned in Kindergarten have stayed with her for 13 years. But it’s more than just reading, writing, and arithmetic for this senior Scot. “Because I started here in Kindergarten, I know what it means to live a balanced life,” she said. Top early childhood programs such as Saint Andrew’s School achieve success by combining best practices into one unique model. From the attention to the prepared environment, focus on social-emotional health, targeting of literacy development, use of the Two-Teacher Model, and spot-lighting of visible learning - there’s so much that makes the early years for a child special at SA. Picture this! As a kindergartener writes in her journal, she pauses to look at the Word Wall, a reference tool for commonly used words such as “the”, “and”, and “look.” Peek into all JK and K classrooms and see students constructing knowledge at their own pace in similar ways, guided and facilitated by teacher modeling and direction. As the kindergartener writes in her journal, the teacher keenly observes the student’s thinking moves. This kindergarten teacher uses her adept management of that independent journaling task to know exactly how to target the next learning experience. Children in Junior Kindergarten and Kindergarten are spending their time thinking, talking, reading, writing, and listening, engaged in routines like “Morning Meeting” and classroom jobs. Tasks such as these are authentic and worthwhile - each having learning value, rather than just keeping students busy. 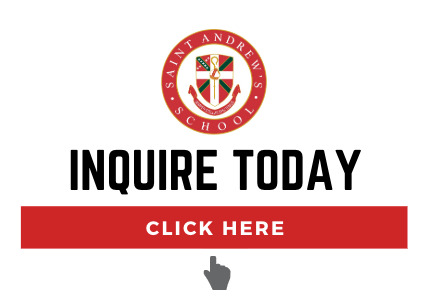 But what sets Saint Andrew’s Early Childhood experience apart from other preschool and kindergarten programs is eloquently captured in the words of a longtime Scots parent. Dawn Weisz, parent of Bria ‘19 and Ella ‘23, is a member of the Friends of the Arts (FOA) parents association and proud parent of two “lifers.” Lifers are students who have been at Saint Andrew’s School since Junior Kindergarten or Kindergarten. “My daughter Bria has been here for 13 years...and in that time, it has become so much more than a school. It is our home,” said Weisz. At the beginning of Bria’s senior year, she was named a National Merit Semifinalist, competing and triumphing against 1.6 million juniors in more than 22,000 high schools across the country for highest marks on the PSATs.